Is it a wolf? A new kind of hybrid dog species? A relative of Bigfoot? 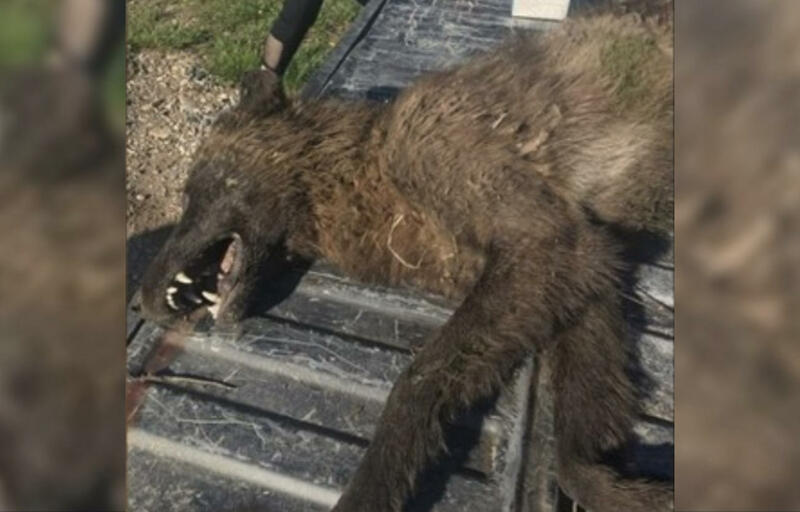 This mysterious furry creature shot in Montana has even wildlife experts puzzled. The animal was shot on a ranch outside Denton on May 16, but looks as if it came out of the Ice Age. It looks almost like a wolf, except some features are a bit off. It has long grayish fur, a large head and a snout; but its ears were too large, its legs and body too short, and its fur uncharacteristic of that common to a wolf, the Great Falls Tribune reports. "We have no idea what this was until we get a DNA report back," Bruce Auchly, information manager for Montana Fish, Wildlife and Parks, told the newspaper. "It was near a rancher's place, it was shot, and our game wardens went to investigate. The whole animal was sent to our lab in Bozeman. That's the last I ever heard of it," Auchly said. Montana Fish, Wildlife and Parks (FWP) took the creature in to do DNA tests, and are working to identify this enigma of an animal. "The animal came within several hundred yards of the rancher's livestock. He shot it and reported it as required by law," Montana FWP said in a statement. "The animal was a young, non-lactating female and a canid, a member of the dog family, which includes dogs, foxes, coyotes and wolves." Several wolf experts looked at photos of the beast and doubted that it was a purebred wolf. Many members of the public agreed. "Social media was quick to pronounce the animal as everything from a wolf to a wolf hybrid to something mythical," Montana FWP says. With DNA samples extracted from the animal's cells, scientists are one step closer to solving the mystery. The process may take weeks or even months for the lab to identify the animal, Montana FWP says. "All of which means it may be a while before anyone really knows what the animal near Denton really was."